We do eat dinner with a candle lit every night, even if it is take out. That little flame helps to elevate the everyday. When the everyday turns to a holiday, it is time to turn up the heat a bit, so to speak. For me that means opening cupboards rediscovering my treasures, mixing burlap & bling and enjoying the process of creating some beauty from what I have on hand. Today I am joining with 29 other bloggers for the Styled & Set tour. The master of the tablescape, Lory of Designthusiam, is our hostess with the mostess. Visit Lory’s table here. 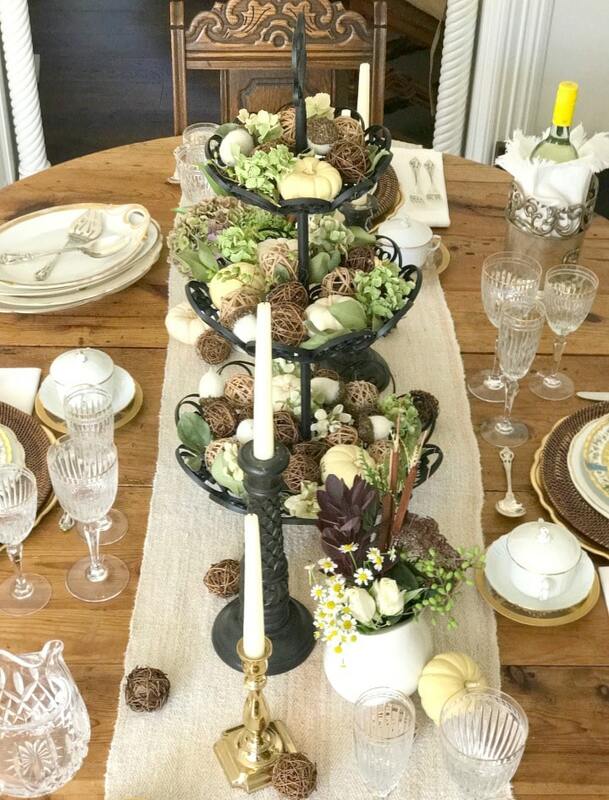 For my fall tablescape I used my stash of dishes, precious & everyday, clippings from the garden and a yard sale three tiered stand as the foundation. Nothing was newly purchased except a tin of cinnamon sticks for the place cards and a bouquet of white roses. Have I told you about my cinnamon stick place cards? I love making these during the holidays. They are easy to create, smell great and are wonderful little gifts for your guests to take home. Look for 6 inch nice looking sticks like these. Learn how to make my Cinnamon Stick Place Cards here. The inspiration for the color scheme for my table comes from this estate sale painting. The painting decorates my kitchen this fall and I am taken daily with the mix of greens, teals & golden yellows. Speaking of my kitchen, did you see the before & after? If I dare say so myself, it is worth a peek ~ and the before video ~ YIKES! These plates, a client’s castoffs, ( ‘you sure you really you don’t want these? ?’ As I practically ran to my car to slide them carefully in the back seat ) played off the painting perfectly. The drying hydrangeas played along too, offering up dusty greens, faded teal and a bit of umber. All the little boo pumpkins scattered around the house clustered together on the table to clearly say “FALL”. I kinda wish Thanksgiving was today as the table look really looks nice. Hope you think so too. Ok, let’s just say it now ~ Happy Thanksgiving! This will be our first real Thanksgiving in our house, so I will try to make it very special. Last year we had no kitchen, so anything is an improvement, but I plan to take it up a few more notches. One inexpensive item that always takes a table up a notch is using chargers. I love my gold charges. They go with just about every theme and certainly suit the holidays. Take it up a notch too and pick up a set for yourself. Click here or on the little charger. At less than $20 for 6 a great deal. Thinking maybe I’ll just toss a sheet over all this & save it for the month ! Thanks so much for coming by today…but don’t go yet! There is so much more to see! Please treat yourselves & visit my friends who also Styled & Set their tables just for you. So pretty Kelly! Love the stand all filled! I’m sure it will be a lovely Thanksgiving in your beautiful home!! Thank you Susan! That stand is pretty great I use it a lot to give height to my table. Gotta love estate sales! Charming, Kelly. I love your place cards. Such a touch of elegance. What a lovely set of dishes! I don’t blame you for scurrying to your car with those! I would have too, without looking back! I love your stemware too. Do you mind sharing the brand, or are they antiques? Everything looks so welcoming. Very calming for the soon to be hectic time of year. Thank you for sharing. Thank you so much Sherry! My stemware can probably be considered antique. We received the set as wedding gifts 24 years ago. It is Waterford and I believe the pattern is Hanover. Calming yes – we need that this time of year. Your table looks awesome love the flower and cinnamon. All the tales look so pretty. Pamela you are so kind! Thank you – enjoy the tour! Thank you Randi! Yes, love those sweet little daisies. What a beautiful dining room you have Kelly! I love that you light a candle every night, even with take-out food! Your tablescape is elegant and inviting….so lovely! Thanks for coming by Jennifer! Gosh Bree thanks so much! I really appreciate your kind words. I love making those place cards – they take no time at all & are beautiful little creations – different every time. Light a candle & get out your sticks! Yes, just cover it up and save it for Thanksgiving. It’s too pretty to waste. Kelly, I love that you have a candle lit dinner every night- so inspiring! This was so beautiful! So gorgeous, Kelly! Candlelit dinner every night?! You guys are the cutest. By the way, I love your new hair 😉 Stunning! Kelly what a beautiful table and I love that you light a candle for dinner every night! Such a great idea! Your table is wonderful! I LOVE love love the cinnamon stick place cards!! I also love your sentiment of using small things to elevate the everyday, but your holiday table has certainly taken it up many many notches! Very pretty palette and tiered centerpiece is lovely!! Thank you so much Lory!! Coming from the master of the table scape I am beyond flattered! Thank you too for including me in the tour! I’m borrowing your cinnamon stick place card idea this year friend…thanks for that, and for the beauty that you share! Oh my “beauty” that I share – you blow me away with what you conjure up! Thank you Janet that mean a whole lot to me. Kelly…your table is gorgeous!…and so love the cinnamon stick place cards!….you always amaze me with your creativity! Kelly how beautiful! I loved the drying hydrangeas and the cinnamon stick place cards. What a delightful setting for loved ones! Wow! Thank you so much Fabiana!